First, it’s important to realize that home warranties are not the same as homeowners insurance. Homeowners insurance is required by your mortgage company. It covers your personal property, and the structure and contents within your home should an accident or disaster occur. When your home burns down, is damaged by Mother Nature or intruders, or if the water heater springs a leak and ruins your hardwood floors and carpeting, your homeowners insurance will cover that. A home warranty, on the other hand, is completely optional. It covers the repair and/or replacement of major appliances inside the home, and it’s typically only good for a specified amount of time. When the hot water heater quits working (though not leaking), the oven burner doesn’t work properly (though not burning your house down), or if the refrigerator suddenly quits working, a home warranty would cover that. Often, a home seller will provide a home warranty as an indication that the home they are offering for sale is in good condition. After all, if someone is willing to back the mechanicals inside the home, life should be trouble-free for the new home purchaser, right? Well, not exactly. A home warranty is no guarantee. #1 – Home warranties are for a specified length of time. Usually, a home warranty is written for a period of one year. It can be renewed. However, you may not receive any notice that the home warranty is expiring, because there is very little incentive for a carrier to notify you. #2 – Not all home warranties offer the same level of coverage. Each home warranty policy is different. 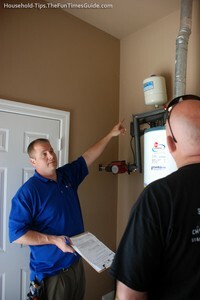 Basic coverage may include your furnace, A/C, and major appliances. Coverage may be limited to certain circumstances, as well. Their goal, of course, is convince you to upgrade to a Plus or Gold plan which will provide better coverage. Naturally, the cost will climb substantially. #3 – The cost of home warranties varies greatly. A home warranty policy can range anywhere from $250 to $600 annually, depending on the level of coverage. How good the warranty is depends on how many loopholes are written into the fine print. Many States have no regulations governing Home Warranty companies. The wise shopper will confirm which government agency controls Home Warranty companies in their state and check for registered complaints before signing on the dotted line. #4 – There is a deductible involved when you make a claim. The amount can be anywhere from $50 to $100 per incident, depending on the policy. Most insurance companies won’t allow you to bundle repairs — because the deductible will be applied to each individual item. It’s said that bad luck happens in three’s. If the refrigerator happens to quit on the same day the air conditioner goes up in smoke you, will probably have to pay 2 deductibles, even though you made the claim for both at the same time. #5 – You don’t have control over who does the repair work. The home warranty carrier will require you to submit your claim before the work is done and, in many cases, they will require that their contractor (one which they have already negotiated a reduced rate with) does the actual work. This leaves you out of the picture as to the quality of workmanship, time schedule, and other aspects of the work. #6 – Customer satisfaction with home warranties isn’t a strong point. Recent reviews indicate many customers are often surprised that certain home repairs aren’t covered by a home warranty. Reactions range from moderately satisfied to down right outraged at the level of documentation required to secure any reimbursement. In many cases their claim was just flatly declined. Here are the best home warranty companies. Generally speaking, if a home is less than 10 years old, the likelihood that a major appliance or mechanical system will fail during the next year is negligible. Therefore, home warranties aren’t as practical on newer homes as they are on older homes — especially older homes that haven’t been upgraded to include newer appliances and materials. Deciding whether a home warranty is a good investment or not primarily depends on your ability to do repair work on your own, or your likelihood of obtaining help at a reasonable cost through a friend or handyman. calls are not usually covered by home warranties), you really haven’t recouped much of your repair bill with your home warranty. On the other hand, if you have zero home repair skills, or the home is a rental property that you don’t really want to be working on, or if you have physical limitation, then a home warranty will ensure that you’re covered. Regardless of your particular situation, a home warranty can provide peace of mind that someone else will take care of any problems that come up during the policy’s coverage period. Sometimes, peace of mind alone is worth the expense.